Here’s my first batch of jam of the season. The kids are eating all the strawberries out of the garden as soon as they ripen, so we bought a half flat of strawberries from the Woodinville Farmers’ Market. I could have waited until next week when I should have enough of my own strawberries ready for jam, but I was eager to start making jam and decided to buy some. Plus, we go through strawberry jam so fast I’ll need to make a few batches anyway. This batch made 7 1/2 half-pint jars of jam. The 1/2 jar has already been consumed and we’ve already opened another jar. See, we do go through strawberry jam fast! After reading the latest post on A Posse Ad Esse, I hung my head in shame for never using the ends of asparagus plants. I always compost or worm bin the ends, thinking they are not worth using. How wrong I’ve been. A Posse Ad Esse suggested using them in soup. I whipped up a batch, using a “wing it” recipe similar to this one, and the soup was great. Never again with I throw out the asparagus stumps. Speaking of not wasting food, look at the lovely garlic scapes I harvested today. These will be part of our dinner tonight, although I’m still thinking about how I might use them. Got any suggestions for using sage? I’ve got a lovely huge patch of sage that comes back every year. Using it to season foods only uses up a miniscule percentage of the plant. I’m looking for a recipe that would use sage leaves in volume. Maybe something like a sage pesto . . . . Any other ideas? 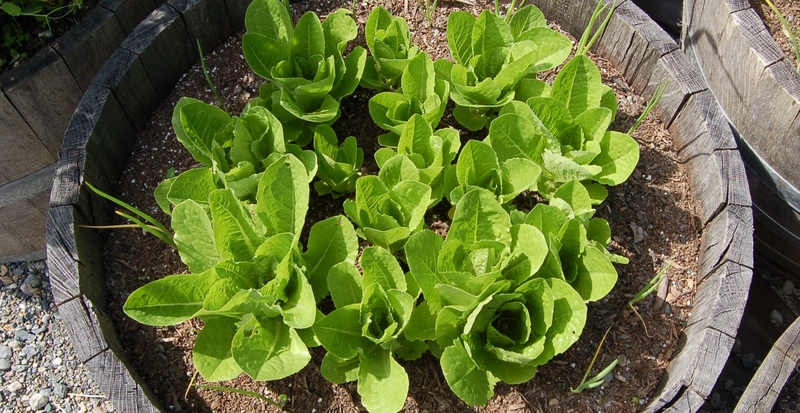 There isn’t much to say about this Parris Island Cos lettuce other than it looks pretty in the wine barrel, don’t you think? Outside, the animals enjoyed the sun today. We moved Harry and Lucy over to a blackberry batch (staking them out) and they munched away happily. Out in the pasture, the chickens scratched away at a pile of weeds I threw to them. This is the north side of the pasture under several large evergreen trees, so there isn’t a whole lot of grass in this area. The exposed dirt does give them good places to take dirt baths, which they seem to enjoy (as much as a chicken can enjoy). Finally, I’ll leave you with a picture of our newest chickens. As you can see, one of these chickens is not like the other. Yes, we have a rooster in this batch. We haven’t determined his fate yet. We moved the new chickens out of the garage yesterday into the chicken tractor in the pasture. They’ll live in the tractor until they are large enough to join the rest of the flock. So, I’ll end by coming back to the sage. What the heck should I do with the huge volumes of sage I have? This entry was posted in Cooking & food preservation, Gardening and tagged asparagus, chickens, goats, jam, lettuce, rooster, sage, scapes, strawberries. Bookmark the permalink. Hi Nicole! Yep, I think the sage pesto will be on my to do list for next weekend. I’ve got a ton of this stuff, though, so I’ll probably do a few different things with it. Hope you are doing well! Hi Sandy, Well I don’t know about large quantity recipes, although I’m planning this year to dry quite a bit to use through the winter, but I tried an awesome recipe this weekend that your pictures brough to mind. Brown butter, add minced sage leaves, then add your garlic scapes to saute or steam. I added other veg–the first handful of peas, some beet greens–and it was delicious! The Italians also deep-fry sage leaves as a snack. Always seemed like kind of a lot of effort, but knowing the Italians, it’s probably worth it! No words of sage advice (pardon the pun!) to share. I have that problem with most herbs in that a little goes a long way for us and I am always a little hard pressed to come up with good uses for them. The strawberry jam looks wonderful. I love how it smells in the kitchen when I am making a batch of strawberry jam… pure heaven! 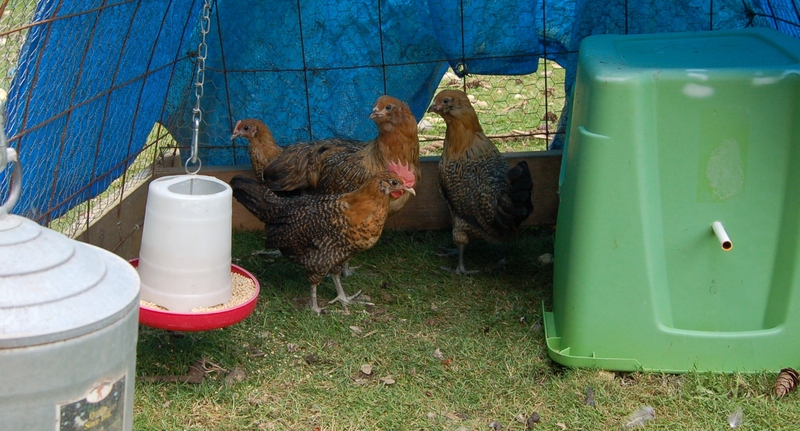 The pictures of your goats and chickens enjoying the nicer weather are fun. Our hens were totally enjoying the sunshine on Sunday. Hopefully they will all get to enjoy more than a day at a time of it in the future though. I’ve been buying meat from a local farmer and he sells unseasoned sausage. I have found that it takes a lot of sage to flavor that properly, and your post reminds me that I should be drying some to season my sausage this winter.